← Automated Restrooms – Is Technology Going Down the Toilet? Congrats on the pickup! I know EXACTLY how you feel. BTW, I actually DVR’d it last week and watched the first two episodes and liked it. Wicked Witch/Mayor may be Emmy-bound. I was thinking the same of Robert Carlyle’s Rumplestiltskin/Mr. Gold. He is amazingly creepy. I’m thinking I’ll get my boxes from Cosco. After all, they are free and already put together. Thanks for the suggestion, Bridget. I can use them as my closets to put my… oh that’s right. In my poverty nightmare I don’t have anything to put in closets. A Spam quiche. Shut up. Thanks to you, I’m now drooling over my chubby dog. Dammit. Instead of naming your pup Machu Picchu, you might be calling it Mushu DogPork. Yay! I feel responsible for your good fortune, since I have been watching the show. It’s nice to start the day with completely unearned smugness. You can take all the credit for the show’s success. Hopefully they’ll thank you publicly when they win the Emmy. Do you want Spam or just the winning Lotto ticket? How awesome is that? I have been watching it and LOVE it. Bratchild does too. Glad it’s not giving Bratchild nightmares. Should be ok. After all, it’s an 8:00 show. I’m so glad you like it! Great news! Congratulations! 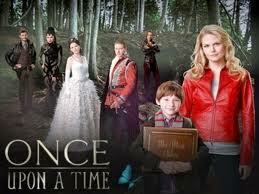 Once Upon A Time is a really great show. And I’m really very happy that you won’t have to make Ikea huts. Do they include duct tape on their freaky wall of hardware? Yes – IKEA does carry duct tape on their freaky wall of hardware. Of course it’s in the homeless section, and the tape has to be waterproof in case it rains. I’m glad you like the show! Funny. I will make a point to watch it. I mean what are blog buddies…acquaIntance…okay stumbled upon your blog and thought it was great surfing bloggers are for. Congrats! Long live the witch! So glad that my new TV obsession (after Pop-Up Video) is actually helping someone! Seriously, I love this so so much that I think about it during the week. I’ll bookmark your weblog and test once more here frequently. I’m rather sure I’ll learn lots of new stuff right here! Good luck for the next! I will right away clutch your rss as I can’t in finding your e-mail subscription hyperlink or newsletter service. Do you’ve any? you are not understanding anything entirely, however this article offers fastidious understanding even. May I simply just say what a relief to find an individual who actually knows what they’re discussing online. You actually realize how to bring an issue to light and make it important. More people ought to read this and understand this side of the story. I can’t believe you’re not more popular since you definitely possess the gift. Appreciatee the recommendation. Will try it out.